OK, so it isn't quite Cape Cod. There's no ocean, no Kennedy compound, no Martha's Vineyard. But Wisconsin's Door County holds its own. Door County is the top half of the state's "thumb." Surrounded by Green Bay (yes, that's the Packers) and Lake Michigan, it is dotted with sailboats and cute little towns. It has long been a favored destination for the upper crust from Chicago. 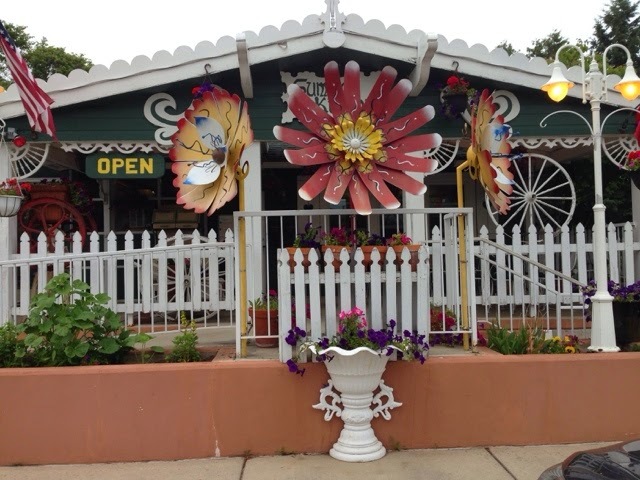 Keith and I started off our first day here with breakfast at the Summer Kitchen. 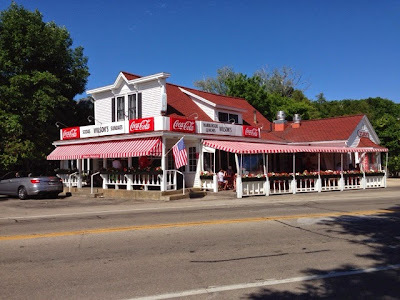 It's one of our favorite restaurants here. Now we are back at our little cabin (more on that later), which is just north of Ephraim. Keith is relaxing, but I need to do some homework. I start a graduate class on teaching writing in about a week. 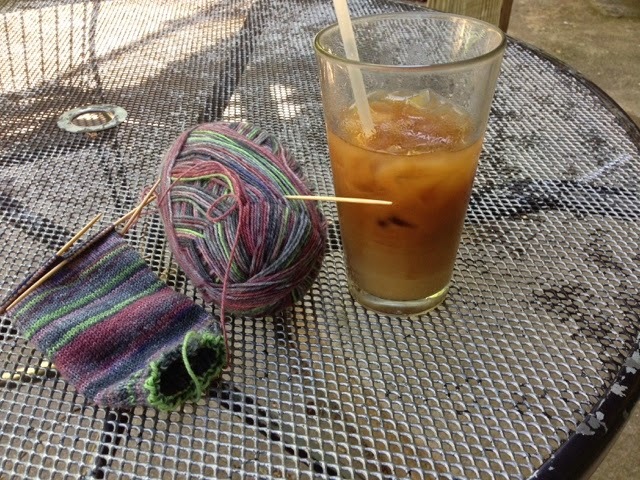 I suspect there will be knitting later. This has to be the slowest pair of plain vanilla socks ever. It's not in my Ravelry project list, so I may have started these as long ago as 2009. Or I just never entered the project. At any rate, they are done now and I am quite happy with them. 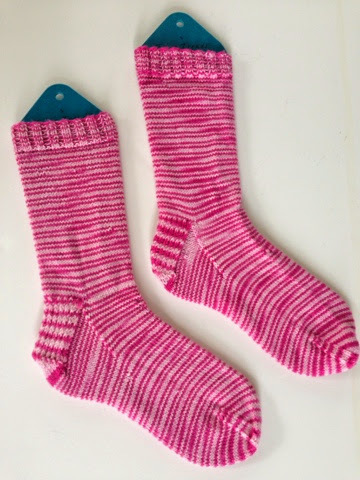 The yarn is Lorna's Laces Sock Stripe Flamingo. It's still available, and I have to say that it both looks and feels wonderful. These are destined to be a Hanukkah gift, but I'm not saying who the recipient will be -- even though I don't think she reads this. You just never know! Who could resist this ball of yummy, scrumptiousness? Certainly not I. So I cast on a 28's Cousin 53! even though I haven't finished anything -- and I swore I was going to do more binding-off than casting-on this summer. Is my sin at all diminished by the fact that this is a gift? This is the second time I've knit this pattern and I'm still enjoying it. 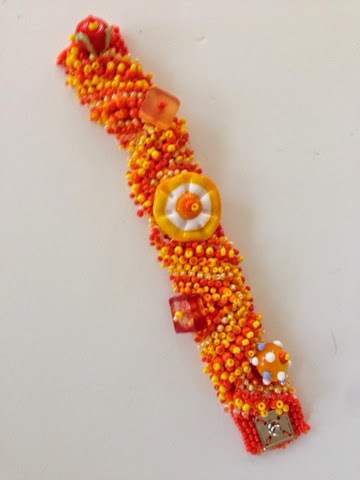 It is a super-simple pattern, perfect for TV watching or socializing. 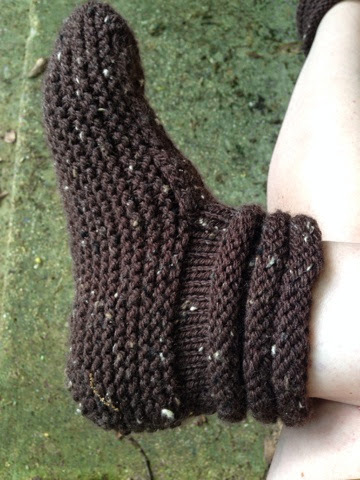 The simplicity is perfect for showing off great yarn. It's another gray day here, so I'm glad I took advantage of yesterday's sunshine to pack up my work and take it on the road. I sipped on some bubble tea while I did the reading for my graduate class this summer. 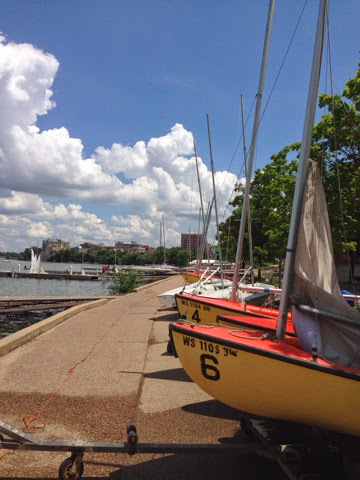 On my way home, I stopped to enjoy the beauty of boats along Lake Mendota. See what everyone else is up to with Tami Amis. This is unusual. I tend to hate the books the group chooses. But I -- and everyone else in the group -- really enjoyed this novel. So did my mom, who was reading it at the same time for her book group. 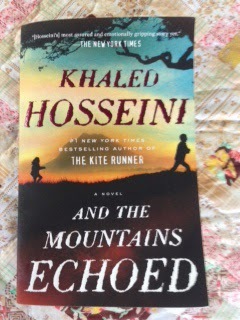 Khaled Hosseini is the author of The Kite-Runner, and I was sure that this would be the same book in a different cover. But it isn't. It's a tightly plotted story spanning more than half a century and extending from Afganistan to Greece to the United States. Even though there is a large cast of characters, they are vividly sketched and easy to keep track of. The theme of caretaking and sacrifice runs through the book, unifying the subplots. All of the women in my book group are mothers and all have taken care of their parents at times, so there was a lot of fodder for discussion. What books do you recommend this summer? We need sunshine somewhere around here. Storms have continued to roll in, and last night a tree branch punched a hole in our roof. I guess that's convenient. We are having siding put on our house, so there was crew already scheduled to work on the roof today. 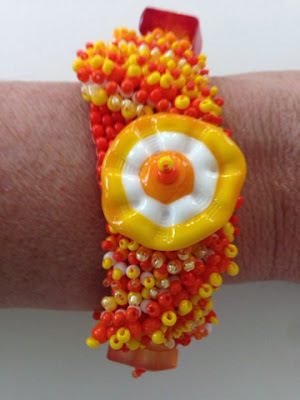 I make a bracelet base using peyote stitch and then embellish it with glass and seed beads. The process is mostly zen, and I love picking the colors as I go along. Before I go into knitting I have to say that it is 7:30 a.m. here and as dark as night. Heavy storms are predicted. We had a number of tornadoes touch down about 36 hours ago, some just a few miles from our house. Climate change: What's not to like? I'm wondering if I should build a cellar to protect my stash and favorite knitted items. 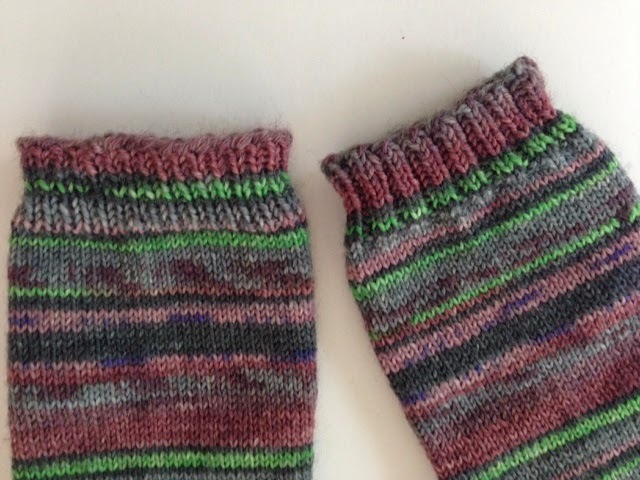 Some of you may remember that it wasn't until I finished this "pair" that I noticed that the cuffs did not match. 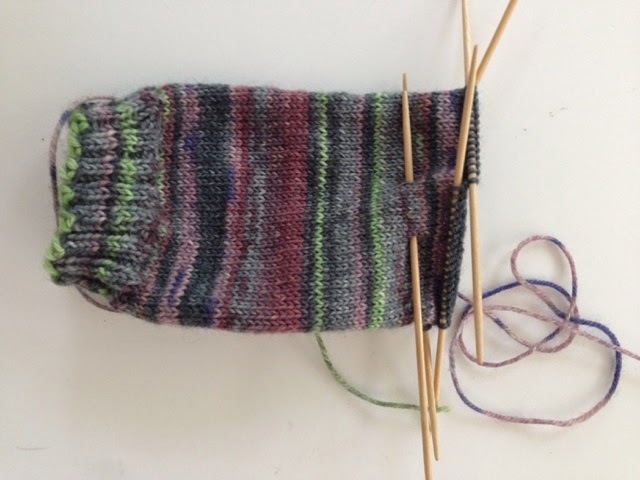 I am not a knitting perfectionist, but this was too much of a flaw for me So I ordered another skein of the yarn and am working away at sock number 3, which will be followed by 2 number 4. 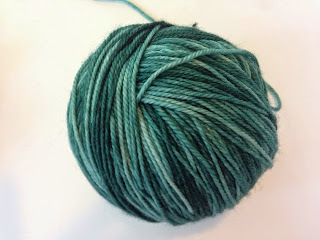 I love Opal yarn. I love these colors, but I am getting a little tired of them! Go on over to Tami Amis' blog to see what everyone else is working on. It is the first Monday of summer break and I am a little bit sad about not going into school. You can't blame me when I work with such great people. 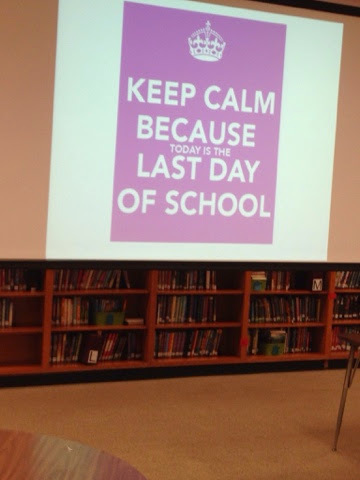 That photo was taken after the 8th-grade graduation ceremony last week. 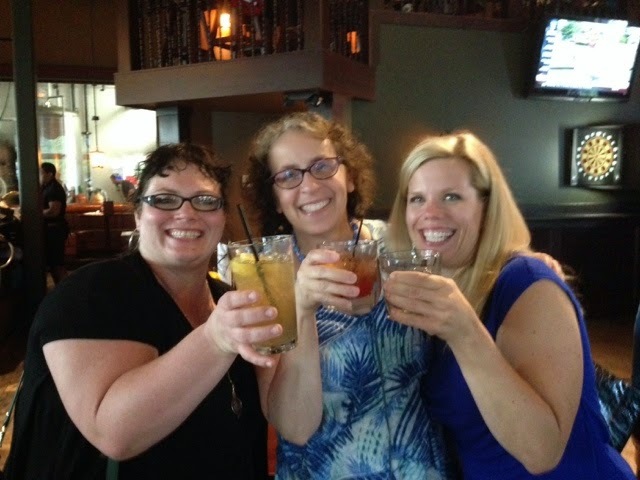 It is a tradition for staff to go out and celebrate surviving another year. The 8th-grade team is really tight and I know how lucky I am to work with such good people. Nonetheless, I can't complain about sipping an iced coffee at one of my favorite cafés instead of drilling students on the Civil War! 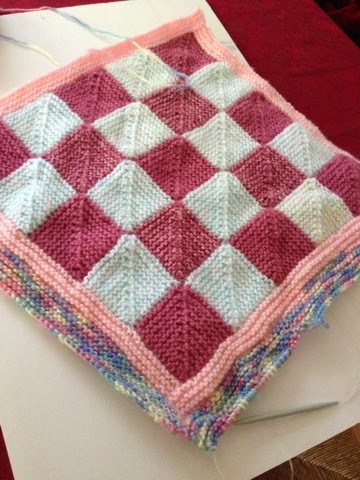 I'm making up this blanket pattern as I go. I swear the colors in this photo aren't quite right, making the colors the blanket look completely mismatched. I swear they are not. I'm going through my supply of Lion Brand Jiffy Yarn. Last week I delivered one baby blanket, and I think it went over well. This one is for the next baby girl to come along. My friends have been turning out one boy after another, though, so it may end up sitting in my closet for some time. I do love making up patterns as I go, as long as they are modular and require no math or measuring. I knit a lot of this one to the second season of House of Cards. I think Orange is the New Black is up next. Although, I find I watch less TV when the weather is nice, as it is now. The down side of that is that I also do less knitting. That is Jen Cushman, business partner of Susan Lenart Kazmer. If you've ever poked around the jewelry section of a Michael's Arts & Crafts store, you've seen her Industrial Chic line of components, really fun and intriguing stuff. Anyway. I've always wanted to work with them because their aesthetic and their products are so amazing. 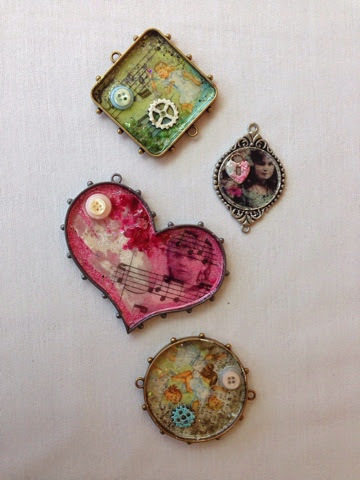 I spent a day learning how to use ICE Resin and ICED Enamels on Saturday. Jen is a great teacher and fun to hang around with. She is more than generous in sharing her experience and know-how. I'm afraid this post is going to sound more like a commercial than a blog post, but honestly, these are great products! ICE Resin is a low-toxic, crystal clear resin. 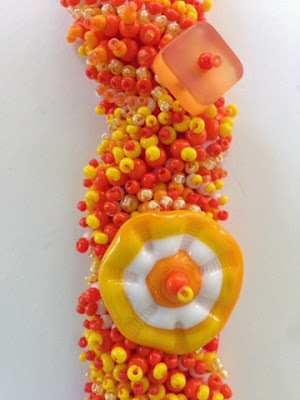 ICED Enamels allow you to get the look of torch-fired enamels without a torch or kiln. Here's what I have so far. Only the second one down is completely finished. I'm going to add more layers to the other three. 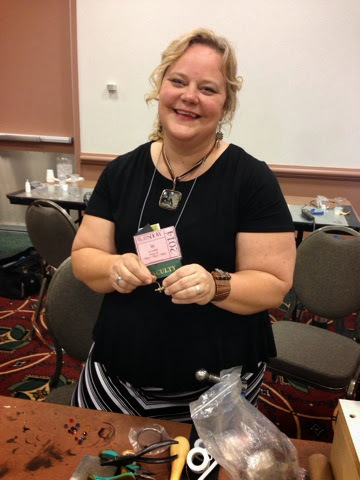 You can't go to Bead & Button (hosted by the same people who put out Bead & Button magazine) without exploring the marketplace, but I think that is a separate post! Are they adorable or what. Not that I take credit for the adorableness. The folks at Knitting Pure and Simple get credit for that. The design is ingenious and the directions are crystal clear. It's a fairly simple pattern. The overcast stitch used to sew up the bottom and back of the heel is very easy, even for a terrible seamstress like me. My only complaint is about the yarn; and you can read about that here if you missed it. 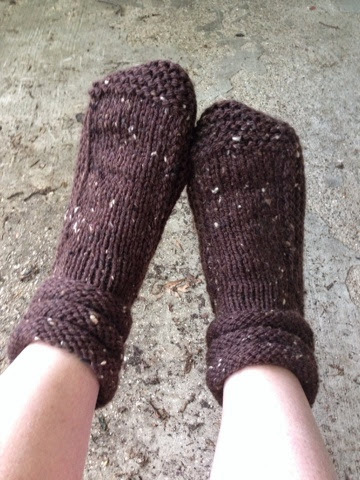 As I hinted above, there will be more Mukluk Slippers. I just think they will be great gifts. It's the Ojo de Dios Shawl from the Winter 2014 issue of Interweave Knits, and it is a stunning pattern. It uses Plymouth Yarn Company's Gina yarn to achieve a dramatic effect. I saw a finished shawl at a yarn store in New Mexico when we traveled over winter break and fell in love. It took me a while to get my hands on the yarn. Apparently the popularity of this pattern caused a run on Gina. Because of the delay, I could have read pattern notes on Ravelry. But I didn't. I just plunged in blindly. 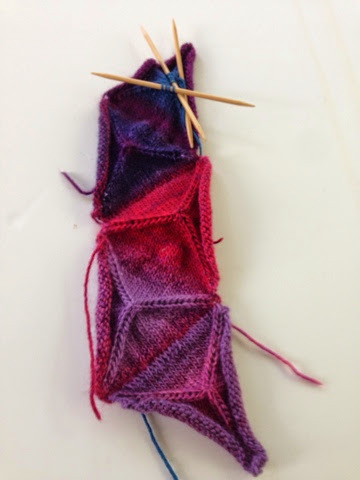 As you can see, you knit one triangle and then pick up stitches to add the rest, forming the lower portion of the shawl. If I had read Rav, I would have known that backwards loop is not the only way to add stitches for additional cast-on. I hate knitting the first row of backwards loop stitches! It is quite fiddley and frustrating. Now I know. And you can see that curling is a huge problem. 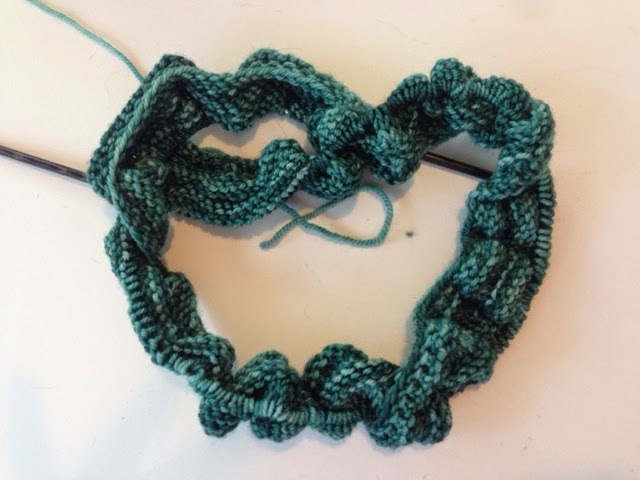 Some knitters on Rav were able to block the edge flat; others said it was impossible. I may end up following the example of knitters who picked up stitches along the bottom and added a border to keep it flat. This is a lot of work. I hope it's worth it! I hope everyone is having more fun with their WIPs. You can find out by checking with Tami Amis.